Party time, cutting up carpets and blaming someone else! My eldest son is currently finishing a year of parties, interspersed with some exams and university applications. As him and all of his friends met their 18th milestone and took tentative steps into adulthood – mostly by getting drunk and posting pictures of one another, drunk, online – I was inevitably reminded of my own teen years. Being allowed to have/getting away with having a party in your parent’s house was a rite of passage that I aspired to. I thought it would make me cool and popular, or at least be a bit of a laugh. I was undeterred by other parties that had taken place where furniture had been destroyed, cars ‘taken for little drives’ by drunken boys, windows broken and police invited to attend half way through the evening. Obviously MY party wouldn’t be like that. So when my parents left me for a weekend the word went out, people were phoned, alcohol was procured, music was chosen, outfits were picked out and the party was on! In those pre-internet days it required a lot of effort to make sure you didn’t just end up with six lads, three tins of pale ale and a dog that someone was supposed to be walking. I am proud to say I managed it, lots of people turned up; there was plenty of booze, girls and boys attended and from what I remember it was a thoroughly enjoyable evening. The following morning was not quite as enjoyable, there was tidying up to do, some sick to clean up in the front garden, a few stragglers to see off the premises and things to put back into their proper places. 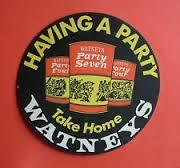 So as we threw open the windows and started to dispose of the Watneys Party Seven tins (you will only understand this reference if you were around in the 70 and 80s) and cider flagons (yes I grew up in Devon). All was going well until we discovered – horror – two cigarette burns in the middle of the front room carpet. Right in the middle, under the place the coffee table went, but clearly visible through the glass top. There was only one thing for it, I would have to come clean, confess and face the consequences, and there would be hell to pay! Or, if you are thinking on your feet, cut two bits of carpet from the corner of the room, buy some new fangled super glue and fix it. Good as new and nobody noticed, all in all the party was a success and I was a bit older and a bit wiser. Did I ever mention I have a sister who is two years younger than me? While I was away studying she too had a party. She too moved all the furniture out of the way. She too managed to get a houseful of teenagers slightly drunk and raucous, she too had to tidy up the next morning. Unfortunately the heavy footfall of the party had undone all my sterling work with the superglue two years previously, not knowing this trick, or how the damage had happened, she felt he had to fess up. There was hell to pay!